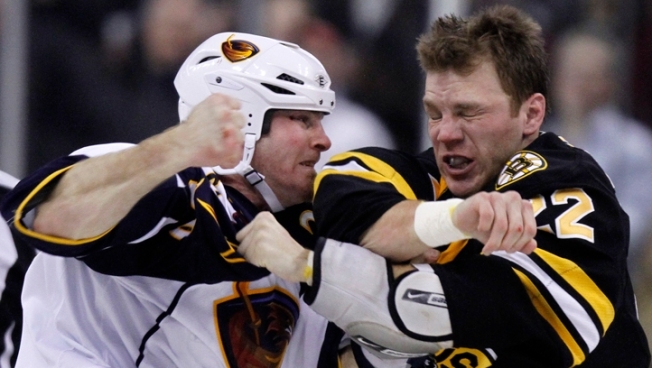 Fighting in the NHL is a part of the game, but Junior hockey executives are seriously considering banning fisticuffs completely. While the NHL has yet to propose legislation that would eliminate fighting from the sport, two prominent junior hockey officials are ready to consider banning it from several amateur leagues known to send players to the pros. After research continues to prove it as a factor in concussion-related injuries, Hockey Canada Chief Executive Bob Nicholson said it's his goal to eliminate fighting as quickly as possible. David Branch, president of three major junior hockey leagues, the CHL, OHL and QMJHL told the Times that concussion-related injuries would be less of a problem if fighting was prohibited. The effect a ban on fighting in juniors would have on the NHL game could be huge. Although fighting is not allowed at the NCAA level, many young players earn roster spots based on their ability to intimidate. Since its creation, hockey and fighting have been involved in a hostile, yet loving marriage. The rough stuff is loved by fans, but injuries have continued to pile up. With the injuries and deaths of stars and fan favorites the likes of Sydney Crosby and Derek Boogaard due to concussion-related events, the NHL may have to take a close look at the thoughts of junior hockey executives such as Nicholson and Branch.